Our journey begins in Cape Town and continues north-east along the Garden Route up along the Western Cape and into the Eastern Cape. After Port Elizabeth, we head north-west and cross over the Mountain Kingdom of Lesotho, back into South Africa via the majestic Sani Pass. From here the journey continues east to Durban and then north to Swaziland. 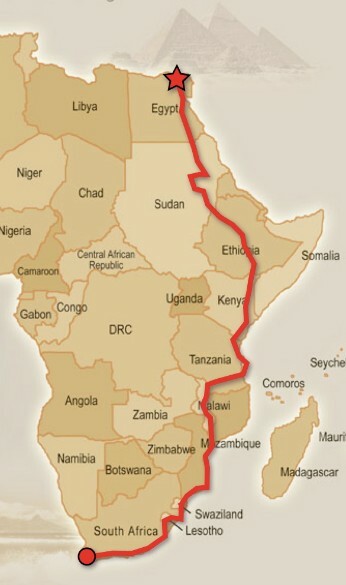 The Swaziland crossing is the shortest leg of the trip (approximately 165km and will take the team to Portuguese speaking Mozambique and the start of the Great Rift Valley. We continue north and enter Malawi at its southern tip, moving up along the western shore of the famous Lake Malawi and into Tanzania. We then cycle north-east to Dar es Salaam, taking a short side trip to the island of Zanzibar, before making our ascent of Africa's highest mountain - Kilimanjaro. The vast expanse of the Massai Mara in Kenya is next, as we head ever further north. After a few days in Nairobi we continue northwards skirting Mount Kenya and making our way into Ethiopia. Upon entering Ethiopia we venture through the Highlands to arrive at the capital, Addis Ababa. From here we start moving north-westerly to Lake Tana, the origin of the mighty Blue Nile. Keeping with this bearing until Khartoum, we cut across Northern Sudan (north of the conflict zone), where the locals are reported to be some of the friendliest in Africa. From here we follow the Nile to Wadi Halfa and enter Egypt via Lake Nasser, aboard a ferry. Continuing down the Nile and stopping at various historical sites, we eventually arrive at our destination in the shadow of the Great Pyramids of Giza, in Cairo. This is the intended route, however the final decision on individual legs of the journey will depend on local conditions.